We’ve all heard of the Bag Monster — that scary mountain of disposable plastic bags that accumulate in cupboards and closets–or worse, blow down the streets and into waterways and threaten wildlife. I tried on the ChicoBag Bag Monster costume at SF Green Festival in 2009. Good lord! How many reusable bags do two people actually need? Apparently, I am not alone. My friend Amber Strocel has blogged about having too many reusable bags. And in her post, she links to others in the same situation. Reusable bags have become the swag du jour at many events. Some of them are so cheap that companies buy them and hand them out like disposable bags. Usually, the give-away bags are not cotton, like the ones in my growing collection, but cheap non-woven polypropylene bags that look like cloth but are actually plastic. A reusable bag is not green in and of itself. It doesn’t magically counteract the impact of Styrofoam just because it’s added to the package. it isn’t green lying in a pile of other unused reusable bags. Reusable bags require materials and energy to manufacture, and just like anything else, are only green if they take the place of disposable bags. Many disposable bags. Which means, we not only have to remember to bring them with us whenever we go out, but we should resist the urge to accumulate more of them. The person with the most reusable bags does not win. I like to carry a couple of ChicoBags with me in my purse because they stuff up very small, so I am never without a reusable bag, no matter where I find myself. And I carry several canvas bags when I am going on a planned grocery shopping trip or to the farmers market. Some people keep a few in their car. I don’t have a car, so I just have to remember them. Michael carries extra bags with him and offers them to people in line at the checkout counter who don’t have a bag. He says, “Here, would you like one of these? Just please remember to bring it back with you and use it again.” There are still a lot of people who don’t have their own reusable bags. We can also offer them on sites like Yerdle, Freecycle, Craigslist, or use them to drop off unwanted items at thrift stores. My goal is to reduce that pile to only the number of bags we will actually use, and to USE THEM! What ideas do you have for remembering to bring your bags and for spreading the wealth if you have too many? 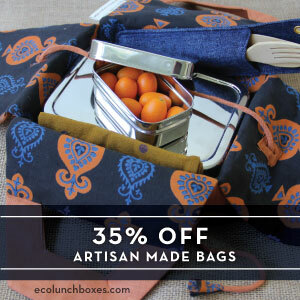 Ambatalia Handmade To-Go Bags, Furoshiki Napkins, & More! This entry was posted in reusable bags on February 1, 2013 by Beth Terry. There is an answer to those cheap nonwoven polypropylene bags: It’s longer lasting, more sanitary, and can be recycled if it gets run over by a tractor! It’s a CRESBI crate! The company who created them – Sun Sugar Farms – will even give a $0.10 credit for every reusable bag you give them which they use for weaving into pet rugs or even “packaging”. Yes! In fact, I mentioned the Chico Bag take-back program in my book! Thanks for the info Cassidy. Now I know where I can retire my trusty Chico bag that I’ve had all these years. My handle started to tear recently and I’m going to try and sew it first. But it’s nice to know we can retire our bags to be re-purposed into some new. Life Without Plastic is a fantastic company! As you read the book, you will discover that I profiled the owners on Pages 142-143. Oh, one other thing… the URL is lifewithoutplastic.com (without “my”). Just in case anyone reading this wants to check them out. I have placed a reusable bag full of reusable bags in each of my cars. Whenever I am shopping, I always have them. No more leaving them at home. Also, our local animal shelter has a resale shop and gives them out to customers, they are donated…a good way to get rid of excess reusable bags! This speaks to a larger issue, one I have at least, with using reusables, etc. : clutter. I have yet to figure out the *exact* number of bags, bottles, jars, etc. I need, so I’m constantly collecting/looking for the right kind for everything we use. For example, there’s the *best* jar for honey vs tamari vs oil… so forth. Working on it, but still feels cluttered! I have found I have been able to keep my stash at a minimum by saying no when I am offered a reusable bag (unless it is really cool and awesome). I always have at least one on me so that really helps. Love the freecycle idea for getting rid of any extras! My local food co-op has signs in the parking lot that read “A bag in the hand is worth two in the car!” and a bin inside for donating excess reusable bags to anyone who’s forgotten to bring their own. I like Chico bags for this reason. I almost always have one clipped to my purse and another in my shoulder bag. There’s always Freecycle if you have too many. You could also give a few to Domestic Violence shelters to give to the families starting over with absolutely nothing. Some of our local markets have placed signs in the parking lots “Did you remember your re-usable bags,” and that has really helped me. A nice thing to encourage other markets to try! Buy the reuseable bags that roll up small and fit in my handbag – that’s the only way I can remember to take them into the supermarket! Before I got them I would always forget. I have a small bag that zips flat that I keep in my purse for small trips. I have a bag of bags that I keep behind the drivers seat. Remembering to take them into the store is not the isssue. What took a long time was to get the muscle memory in place to ensure that I got the bags BACK to the truck. These ecobags helped alot because they pack down so small. keep in the car……nearly always use a vehicle for significant shopping trips. And my wife has a medium one folded in her handbag…..so it goes everywhere. And just carry out smaller items – no bag at all. Keep them in my bag, in my other bag, in my car, on my bike. I definate;y have bag buying issues and bag monsters! Leave them in the car. I have a bag of bags. They live in the trunk and if they come in the house they go on the door knob so I can’t leave without taking them back to the trunk. Yesterday, my unsuspecting purse held 3 kiwis, a bottle of olive oil, a pineapple and a chocolate bar. When in doubt, make use of a big purse! Have quite a few of the little pouch fold away reusable bags ala Greener upon Thames. They are much easier to always have a few in your hand bag/glove compartment/pocket and are so light and don’t take up much room. I find the bigger ones take more of an effort to remember to have on you. Leave the bags in car. If you go into store and forget them in the car, walk back to car and get them. Easy. i alternate between my big canvas tote bags, and actually taking paper bags from the store. the paper bags are used again in my kitchen garbage can as a liner instead of plastic. i feel like it’s a good balance. and i never, ever take a plastic bag from a retailer. ever. Whenever I would forget my reusable bags, my punishment would be either going home and getting them or having to carry all my stuff. Pretty soon you remember your bags. I also try to keep a few at my desk at work and in the car just to make sure all my bases are covered. great post! please include an update reminder to occasionally launder the cotton ones, and wipe down the non-cottons with antiseptic, thanks. I always have two Envirosax that roll up very small and fit into my purse. Then I have a couple in the trunk of my car in case I’ve been lazy and neglected to put my Envirosax back in my purse after using them. I’m at a good number of reusables now, but when SJ’s bag law first kicked in, I used to bring an extra or two to the store and give it away to someone in line who needed one. I don’t own a car and had bags before. Then I bought a nice granny style shopping cart (the fabric kind). So no need for bags, all goes in the cart and wheels right back home. I have a closet space that looks just like that! Even worse is, whenever I forget to bring a bag, I “punish” myself by buying new ones to carry my stuff home. Then I hide them in my study closet, so my husband doesn’t see that I bought even more of them. i got a giant beautiful canvas bag 20 years ago from the j peterman catalog. it holds all my food at once every week. its prob half worn out and i guess i’ll stop shopping once its gone because there will be no other. I put them all in my larger insulated bag and hang them on the doorknob. That its the only way I remember to put them back in my car. I leave them in my trunk. When the groceries are taken out, I take them back outside again. To keep them organized, I put all of them inside one bag. That also makes it easier to bring them into the store. I keep one attached to my purse/diaper bag the rest are in the trunk. I have made most of my bags, but I did by a market basket which I use for multiple purposes, it holds a lot. I’m from Manhattan and don’t have a car so I barely remember my keys, money, phone ensemble because I like to travel as light as possible. I have yet to use a reusable bag, and it frustrates me.